The Falcon is a traditional puukko style fixed blade knife, hand-made in Finland. It features dyed curly birch wood handle with nickel silver bolsters. Full-tang two-tone finished carbon steel blade. 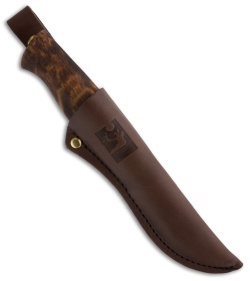 Includes a premium leather sheath with belt loop. I wasn't sure about the design of handle? As it is, very comfortable. Price is fine once you see the blade up close. Very sharp. Again thanks to BladeHQ.